A blog about all my favourite things to see and do in Grey Highlands and the surrounding areas because you'll need more than a day to Play in Grey! Enjoy the Flesherton Farmer’s Market for local crops, food, fun, arts & crafts. Discover the creative forces at the ARTSONTEN Gallery & Boutique, including the amazing Cuckoo Valley Garden. Time for a manicure appointment at Markdale Nails & Spa. Shop for that one of a kind treasure at Classic Consignment where you will find antiques, arts, crafts and so much more. Enjoy lunch at the old fire hall that is now Fire & Ice Restaurant. Hike at Old Baldy to take in the spectacular view of the Beaver Valley. Experience the harvest at Beaver Valley Orchard & Cidery with a tasting & an artisan cheese platter. Enjoy local culinary creations with dinner at The Flying Chestnut Kitchen. Classic Consignment is like walking into a treasure box! The Flying Chestnut Kitchen is amazing...be sure to make reservations! Follow The Art Map Open Studio Weekend and visit the many art studios in Eugenia and Kimberley. Visit the alpacas at Kickin’ Back Alpaca Ranch and shop their alpaca boutique. Lunch at the Bicycle Café, offering an eclectic menu and décor. Enjoy a shopping experience at The Rusty Star in Maxwell where we will find hand crafted Mennonite furniture and fabulous home décor. 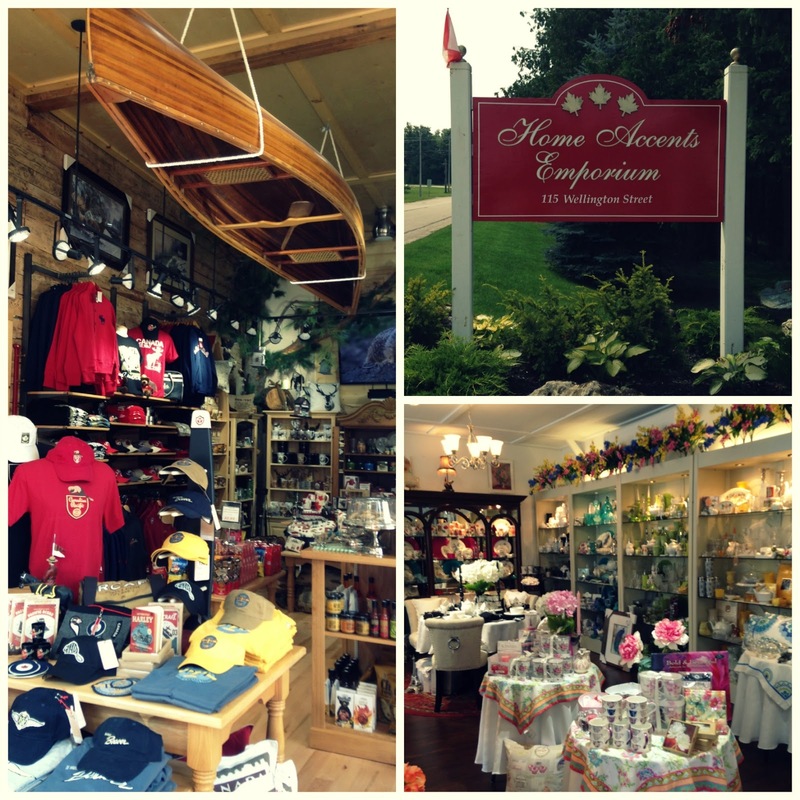 Continue our shopping trip at Home Accents Emporium in Feversham. The Bicycle Cafe is such a great place to gather with friends. This past Thanksgiving weekend gave me so many things to be thankful for as we gathered with family and shared a fantastic thanksgiving meal. But getting from the table to the trail was my favourite part of the weekend. Thanksgiving Monday was this amazing, unseasonably warm and sunny day which enticed everyone to get out and enjoy. I took full advantage of the gift that was this gorgeous day, heading out for a drive and with no particular place to go I would stop each time I saw some scene that inspired me and I had to capture. I took in the view from the Top of Talisman. My favourite barn along Grey Road 7. I loved this old truck for sale. Living in the moment and letting the day take me where it may, I turned onto Sideroad 25 and just over the bridge I stopped to experience the trails at Webwood Falls. The trail to the viewing deck built by the Bruce Trail Conservancy is easily accessed from the road and provides a nice vantage point of this cascading waterfall. If you follow along on Map 28 of the Bruce Trail there is a great Side Trail loop for you to take, making it easy for parking in the same spot where you start and end your hike, which is perfect for a family hike. There once stood a mill here that served the community, the remains of which are still visible with the stone wall that still stands just above the falls. On the other side of the falls stands the remnants of a shed which has much more significance than just an old charming building. It is a Barn Swallow Nest Rehabilitation project where artificial nest cups have been placed inside the shed to encourage nesting of the Bran Swallow, who's numbers have declined in the area. As a kid we had these birds nesting at our cottage and I would hate to see them disappear from the area. There is an information sheet on the outside of the shed, please follow the request and do not enter the structure, I took these photos standing outside. Webwood Falls and the surrounding lands were generously donated by James Horwood and is actually a nature reserve, protecting the diverse habitat with over 200 plant and fauna species. Jim named the falls in memory of his parents and close to this commerative plaque you can see the remnants of the original homestead perennial garden still evident surrounding the trail as well as a hand water pump. It just makes me picture Mrs. Horwood tending to her garden which makes it so special. Having read about the family donation it made me feel so honoured to be enjoying the beautiful trail that day. On a day of Thanksgiving it seemed so fitting to be at Webwood Falls and I was very thankful that Mr. Horwood gave the gift of these lands for all of us to explore and enjoy. I encourage you to get out and share is his gift if you have not already been. The view of the falls from the other side of the trail. Some of the plant life that was thriving. A friend I found along the trail. The trees guarding the trail. Feversham & Maxwell, a "must-experience" on your Grey't Play List! When you Play in Grey, you cannot overlook Feversham and Maxwell both of which offer you small town charm with their sleepy secrets and hidden gems of the past that you will not want to miss. The Feversham Fall Fair is a true celebration of our agricultural heritage and achievements. It all started back in 1867 with the Osprey Fair. Today, the Feversham Fall Fair draws in surrounding communities and visitors each year, taking place annually the third week of September. It features a parade, animal exhibits, horse shows, antique tractor pulls, children’s events, homemade crafts and so much more. The Feversham Fall Fair can attribute its longevity to community support, which, in many cases spans up to four or five generations. Much more to Feversham... It's a seemingly sleepy hamlet on the edge of Grey Highlands with the Beaver River running through it. But, there is a surprise around every corner. The Feversham Gorge-Madelaine Graydon Memorial Conservation Area offers visitors spectacular landscapes. The natural beauty of the gorge's limestone cliff face majestically borders the Beaver River at a height of 24 metres providing a home to rare ferns and mosses-a botanist’s paradise for sure. A walk on the 1.5 km trail along the gorge will reward you with a photo opportunity around every bend. There are cold water springs, rivulets that make their way into the gorge below, lookout stations and stairways to enhance your experience. This hiking trail can be a wee bit strenuous in places but well worth the effort. A home coming for Kent Hudson, who has returned to his Feversham childhood home. 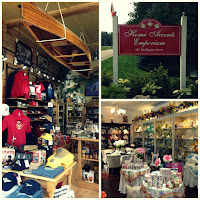 With renovations to his Dad’s former three bay garage, he and his partner Gerry Littlejohn have turned the space into an amazing home décor shopping experience - Home Accents Emporium Kent and Gerry, visionaries to say the least, provide every visitor with small town hospitality and the freedom to browse. From classic to cottagey, you are sure to find something special to enhance your home, cottage or weekend getaway. You gotta shop here! Shorts Store is your quintessential general store with all the rural charm you would expect and a history that goes back to the beginning days of Feversham in 1910. Today you can find a bit of anything you desire from a general store including DVD rentals, full service postal outlet, an LCBO and Beer Store outlet and many other locally sourced products. Don’t miss viewing the mural that is on the side of the store, depicting life in Feversham some sixty years ago, including Lloyd Hudson who’s garage is now the Home Accents Emporium. You will want to include The Village Store as part of your visit to Feversham and check out any events that may be happening at the Osprey Museum, which was originally built in 1903 as the Salvation Army Church. Open year round, quilting is the main weekly activity. If you want to try your had at geocaching, there are two hidden in Feversham as well. Many families in Feversham has made their living based on the river running through town. In the past there were mills constructed to harness the power of the river and more recently the Gott family started bottling that water. 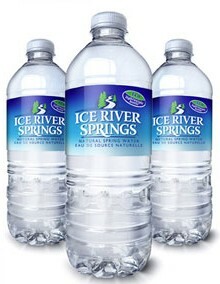 What started as a family owned trout farm in Feversham has grown into a major player in the bottled water industry as Ice River Springs and by bottling for many national grocery store brands. The Gott family has grown their business over a short time period and while the first bottling plant is located in Feversham, there are now plants all over North America including a revolutionary recycling program in Shelburne which allows Ice River Springs to be the only bottled water to offer a 100% recycle bottle. That is a true small town, hardworking success story! Just up the road a bit you will find Maxwell, a small community with more to offer than you might think at first glance. 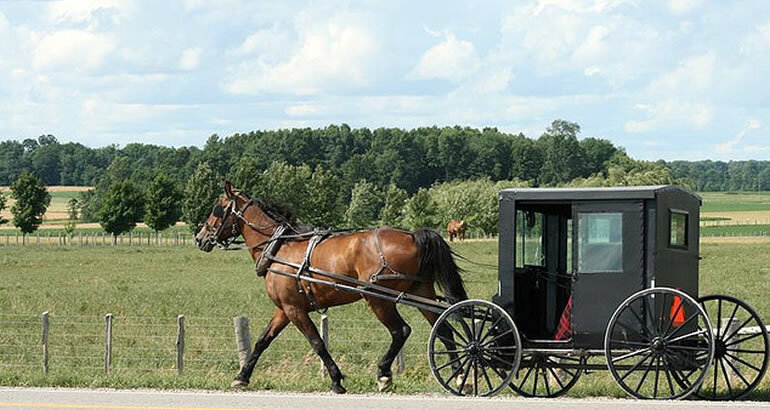 Surrounded by area farms, its rich agricultural heritage continues and is also renewed by the more recent influx of Mennonite families making their homes in and around Maxwell. On any given day you can see the horse drawn wagons and buggies as the Mennonite families make their way around the region. A favourite gathering place for this hard working community and visitors alike is the Gilbert’s Country Café. The menu offers all the favourite diner comfort foods and an all-day breakfast that is served to you on a cookie sheet. This is where you can get small town, country comfort foods in a great atmosphere. They also offer a convenient take-out window in the warmer months with outdoor tables where you can get a Chapmans’ Ice Cream as well as their great take out menu. You will not want to miss the outstanding shopping experience at The Rusty Star. Specializing in handcrafted and hand-finished solid wood furniture manufactured in Ontario by Mennonite families, the showroom is filled with beautiful pieces. They also offer reclaimed local pine furniture, log and outdoor furniture and charming home décor and craft pieces. They even have a bridal registry. You are sure to appreciate the quality of the craftsmanship of our Ontario Mennonite community. 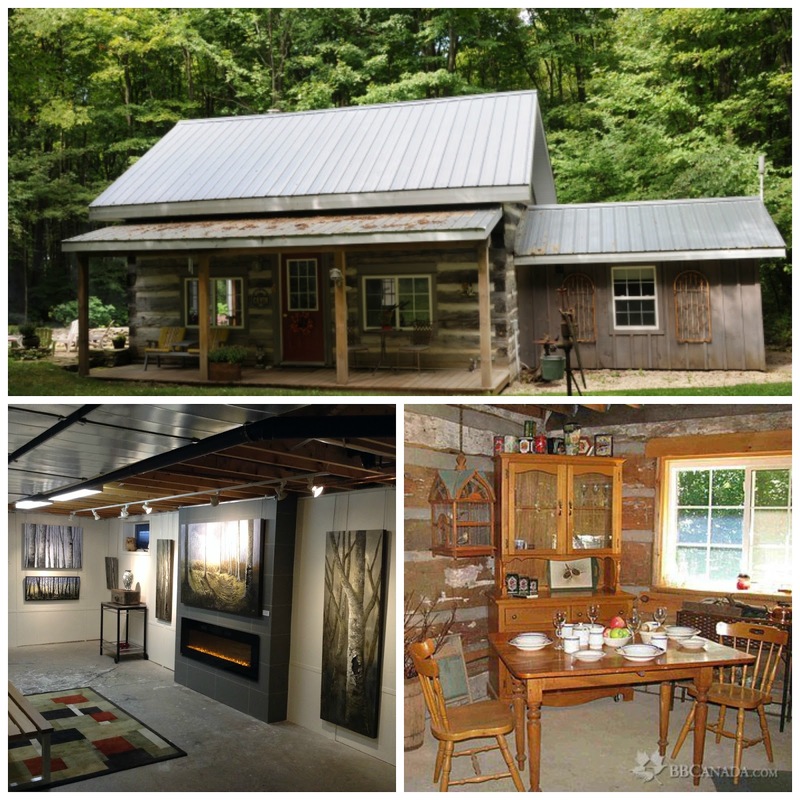 Tucked just off the main road and adjacent acres of a hard wood forest you will find Maxwell’s Cabin Bed & Breakfast and Studio. This unique Bed & Breakfast offers guests the experience of staying in a rustic pioneer cabin that was originally built in the 1852 but now has been lovingly restored by hosts Tom and Dar. Operating yearly from May to October, the cabin is a rustic retreat for couples or families and even has an outdoor shower. Resident artists Dar displays her work in her home studio and is that extra something that makes a stay in the Maxwell’s Cabin even more memorable. 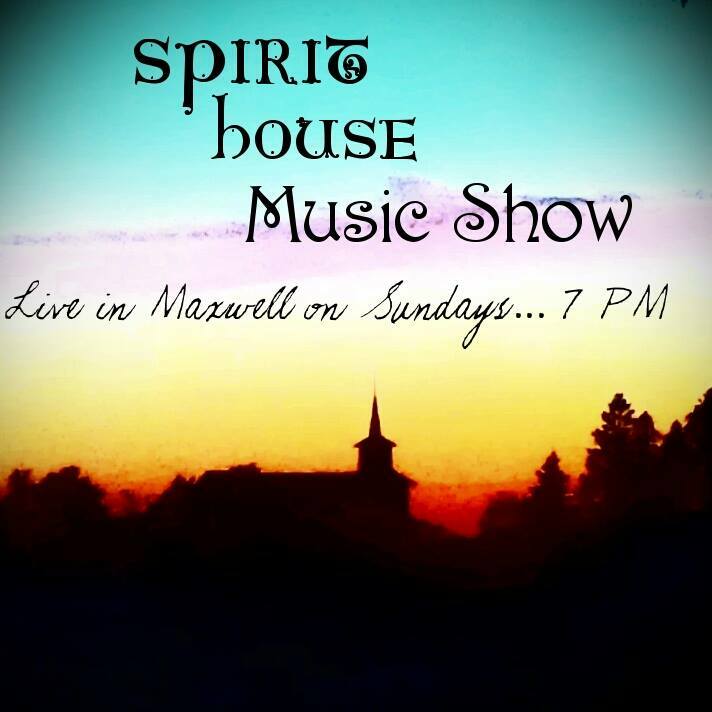 One Maxwell’s best kept secret is the Spirit House Music that takes place every Sunday in Maxwell. The doors open at 6pm with the show starting at 7pm. 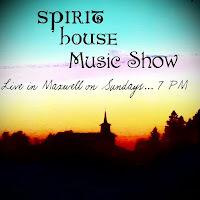 Various artists are featured in the show, hosted by David Russell of the band the Rockafellers. Be sure not to miss all these experiences that the little hamlets of Feversham and Maxwell have to offer and make them a part of your Grey’t Play List today! There is something inspiring about walking on the trails and walkways in Grey Highlands that has always drawn me to the area trails. As a child walking through the forest with my sisters and cousins to get to the swing rope in the channel at Lake Eugenia felt like we were taking an epic adventure. Braving the wilds of the untamed landscape so we could swing off the “Tarzan Vine” and drop ourselves in the water was the types of adventures that we lived for and what made these adventures even better were the treasures we would find along the way. A rock that looked like it had crystals in it, a stick that looked like a magic wand, a bird’s nest that fell or a bottle cap on the road were our most coveted possessions of the summer. Not much has changed since those days, I still love the adventure of walking our trails to discover what we will see around the next bend and my companions have become my kids who are looking for the same adventures that have stayed in my memory all these years. These falls are tucked away on the Lower Valley Road in Flesherton. The falls are named after William Hogg who had built a sawmill here during the late 1870’s. he mill burnt down in 1888, and only a few remnants of it remain. 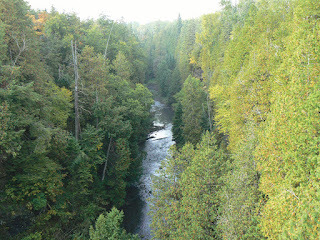 The cedar lined Boyne River will lead you to the plunge falls. While not high in elevation, they are beautiful and offer the opportunity to hike to the bottom for those more feeling more adventurous. The Bruce Trail runs a trail between Hogg’s Falls and Eugenia Falls but this would not be a family hike due to its difficulty. The Old Baldy Conservation Area is certainly one of the most visited sections of the Bruce Trail in Grey Highlands. The walk to the cliff face in the spring offers a forest floor that is blanketed with trilliums which you can’t help but stop and admire. The rock formations and small crevasse offered a fun moment for our boys to pretend they were stuck in the ground. When you reach the cliff face you are struck with a view of the Beaver Valley that seems to go on forever and at each viewing spot you see something just a little bit different that you have to take a photo at each one. You may be lucky to be there on a day when rock climbers are braving the face of the cliff wall. The trail that loops back to the parking area will take you through the forest which has such tall and majestic trees that will have you find yourself looking up as you walk along, but don’t forget to look down or you will miss the beautiful wild flowers that will pop up in the right season. The Bruce Trail runs along the top of the Beaver Valley, where the former Talisman Resort is continuing to be given a new life, soon to be unveiled this summer. This section of the Bruce Trail is also a favourite spot for many to view the sweeping landscape of the valley and the ski hills below. There is a secret spring along this part of the trail, so I have been told because we have not been able to find it yet. We were not the only ones enjoying the autumn views that day, on our way out we say a group of artists had set up their canvases to capture the beautiful autumn scene before them. The majestic 30 meter height of the Eugenia Falls has drawn people in for over 100 years, having been the sight of a short lived gold rush in 1853. Spring time offers the most water but still offers beautiful views year round. You can find the remnants of a hydro power tunnel and saw mill built in 1859 while you explore the trails around the falls. I wrote about one of other favourite spots to hike which is the Flesherton Foothills, check it out by clicking here. Find other great hikes and hosted walks at the www.thewalkingvillage.org.